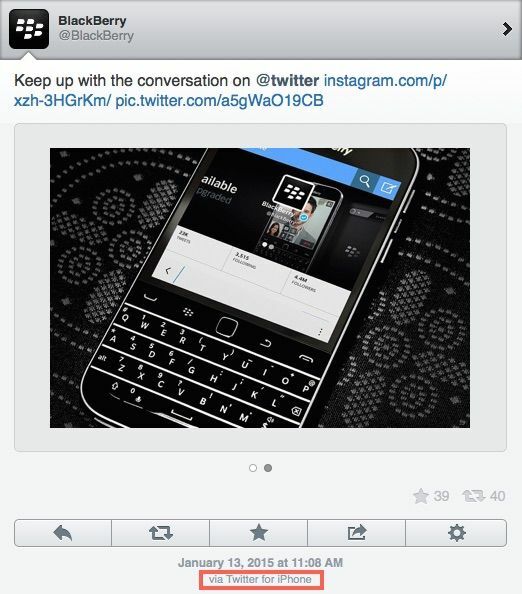 BlackBerry isn’t quite dead yet, but don’t tell that to the person running their Twitter account. The classic BlackBerry keyboard is great for pounding out 140-character tweets, yet whoever is tweeting from @BlackBerry was spotted using an iPhone to implore the brand’s few faithful remaining fans to keep up with the BlackBerry conversation on Twitter. A strong suite of third-party apps isn’t what BlackBerry’s known for, so we can understand if their social media intern reached for a familiar device to bust out their tweets instead of the Twitter for BlackBerry app that definitely still exists. The tweet was deleted after The Verge quickly spotted the mishap. We’re just waiting for the company to release its, “Oh no, we’ve been hacked” excuse. Former creative director Alicia Keys tried that the last time this happened.